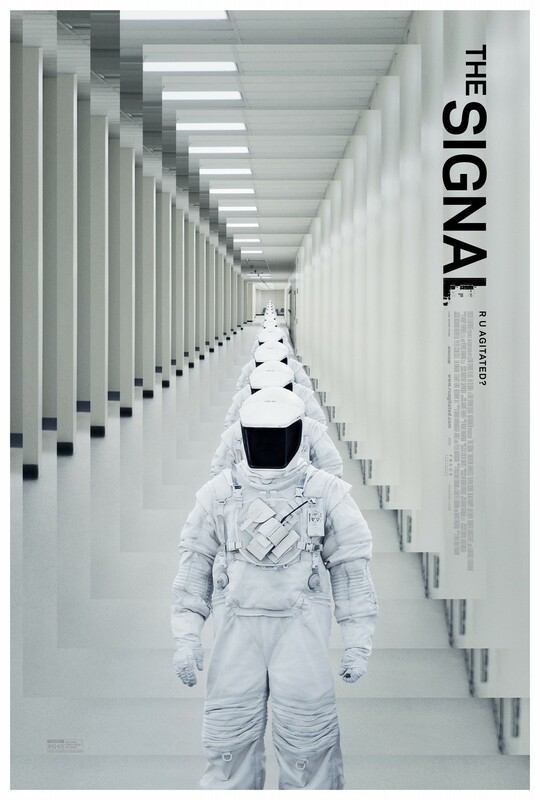 The Signal, from Director and Co-Writer William Eubank, is an independent sci-fi/thriller with nice performances, a creepy vibe, and a great twist. That title, though, it’s a little misleading. Nic (Brenton Thwaites), Haley (Olivia Cooke), and Jonah (Beau Knapp) are on a cross-country road trip to California. Haley is moving to California for a year to study and Nic is none too happy about it. However, his mind is on something else. Prior to leaving, a hacker named Nomad hacked into MIT’s servers and left it looking like Nic and Jonah were behind it. When Nomad pops up again to taunt the pair, they track him to Nevada and head there for a showdown. When they arrive at a desolate shack, everything goes dark and Nic awakens in what appears to be a hospital of some kind. He is greeted by a Dr. Damon (Laurence Fishburne), who informs him that he and his friends had contact with an extra-terrestrial being and are in quarantine. Then the film gets a little weird, but in a good way. Nic tries to escape the complex, while also attempting to figure out what exactly the aliens did to him. What results is a creepy thriller that lags a bit in parts, but is ultimately satisfying. I love movies like The Signal. I got a very District 9 / Chronicle vibe from it, even though it’s not necessarily similar to those films. I think it’s the whole indie sci-fi feel—making extraordinary stories come to life on a fixed budget. However, after seeing the whole film, I felt that the set-up didn’t completely work out—it felt a little weak. Also, the title of the film is a little misleading. There wasn’t really a signal that drew the kids to the encounter—they lured there by cryptic, but directed messages at them. “The Signal” implies that there’s some kind of frequency or something—an audio cue—leading them along. Yes, there is a point where people ask about a sound that Nic can’t hear, but it’s never shown that this tone led the trio along. Also, while the twists in the story are ultimately good, when you think about a couple of them—you’ll know what I’m talking about when you see it—it stretches credibility to the absolute limit. The performances from the three leads are very good and Fishburne is great as always. There were more than a few moments where I felt he was channeling Morpheus. Thwaites is about ready to explode onto the scene what with this, his brief role in Maleficent, and August’s The Giver, and he does a really good job here. Cooke has impressed on A&E’s Bates Motel and she does well here. I liked Knapp as Nic’s best friend Jonah too. All the leads have great chemistry together and they come across like they’re really friends. It works. Overall, The Signal, while not perfect, is an enjoyably creepy little sci-fi film. There are some inconsistencies in the plot, but I was able to largely ignore them thanks to the great performances from the cast and the look of the film. Definitely check it out if it’s playing in your area. This entry was posted in Movies, Reviews and tagged Film Reviews, Films, Hodgepodge, Movie Reviews, Movies, Podcast, Reviews, Summer 2014, The Signal. Bookmark the permalink.